The Mid American Conference holds many advantages for Ohio prospects in football and basketball. One of those advantages is that six of the twelve schools are in-state schools, while four more are nearby in bordering states. 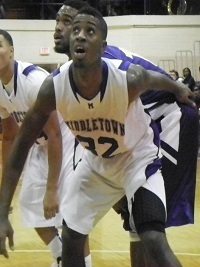 For Middletown combo guard Geovonie McKnight that advantage made a big difference in his final decision. After taking the process slowly throughout the school year the 6’3 McKnight chose Miami (OH) University on Monday, a school that rests less then 25 miles from Middletown high school. In the end the allure of staying close to home so that his family could watch him play was too much for the talented and aggressive slashing guard to turn down as he chose the Redhawks over offers from Winthrop, Tennessee Tech, and Ohio University; as well as interest from Duquesne and Nebraska. New head coach John Cooper, who was hired away from Tennessee State earlier this month after longtime Redhawks coach Charlie Coles retired, plays at as high of a pace as any team in college basketball. That pace, and his comfort level with Coach Cooper, also played a big role in the recruitment of McKnight; the first recruit in the Cooper era. Comfort should come quickly to Geovonie as he joins two other Middletown alums in guard Allen Roberts and forward Billy Edwards, both of whom missed most or all of this past season with injury. Returning those two athletes along with McKnight, who possesses high level athleticism, should have Miami (OH) fans excited for next year; at least their newest team member thinks so. McKnight sees himself as an athletic and playmaking combo guard whose aggressiveness should provide a spark for Miami (OH) on both ends of the floor last year. Known as a tough competitor, a reputation he gained by singlehandedly taking his team to the Ohio Southwest Regional Final this past season, he should have a chance to challenge some of the more experienced guards for minutes early in his career. As a senior this year McKnight won just about every possible award in Southwest Ohio, played in the North-South all-star game, the Ohio-Kentucky all-star game, and led his team to twenty wins and an outright Greater Miami Conference championship. On the season McKnight averaged a league leading 19.5 points along with 6 rebounds, 4 assists, and 2 steals per game. Cincinnati Aiken PF Paul Woodson committed on Monday as well. The 6’7 athlete chose Division II Lincoln Memorial (TN), one of the top D2 programs in the country. After coach Seth Greenberg was fired during his visit to Virginia Tech on Monday it only took Cincinnati Aiken PG/SG Willie Moore one day to schedule his next visit. The 6’3 star will be officially visiting South Carolina on Wednesday-Thursday and then is planning a trip to Oregon for next week. After getting his release from Ohio University last week 6’5 Pickerington Central SG Caris Levert is now considering Iowa, Purdue, Michigan, and Xavier. The shooter is working on visits to all four schools over the next few weeks. So far Iowa and Purdue have offered Levert while Michigan is rumored to be the leader.